Xiaomi Mi 5s expected price in India is ₹21,999. Watch your favourite video songs and movies in video player. It supports MP4, DivX, XviD, WMV file types. 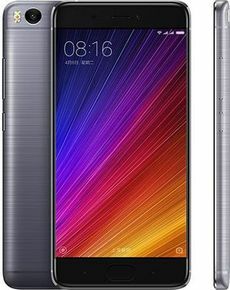 The Mi5s is the new Xiaomi flagship and an incremental update over Xiaomi Mi5. This time, Xiaomi has used a metal back cover that should go a long way in making the phone feel substantial. On the front, you will find a 5.15-inch Full HD high-contrast and bright display panel with very narrow bezels surrounding it. On the inside, the Mi5s houses a 2.15GHz quad-core Snapdragon 821 SoC with Adreno 530 GPU. You get to choose between 3GB LPDDR4 RAM/ 64GB UFS 2.0 storage and 4GB LPDDR4/ 128GB UFS 2.0 storage. Out of the box, the Mi5s is running Android Marshmallow based MIUI 8 software. The dual SIM handset includes a 12MP rear camera sensor (1/2.3 inch in size) with dual-tone LED flash, f/2.0 aperture, PDAF, 4K video recording, and a 4MP front-facing camera with large 2-micrometer pixels. An Ultrasonic fingerprint sensor is mounted on the rear which can read your finger impressions even when your hands are wet or sweaty. Other features include 4G VoLTE, WiFi 802.11ac dual-band (MU-MIMO ), Bluetooth 4.2, GPS/GLONASS/Beidou, NFC, USB Type-C, 3.5mm audio jack and a 3200mAh battery that supports fast charging. The Mi5s is already available in dark gray and golden color in China. Expectedly, you will be able to buy Xiaomi Mi5s online in India before the end of 2016. The Xiaomi Mi 5s takes after where the Mi 5 left off and makes a few notable steps to improve its flagship status .It switches to the latest Snapdragon 821 chip, ups the base storage, It retires the glass panels in favor of a metal unibody.